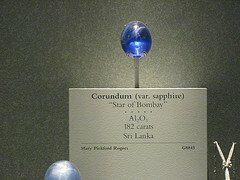 Sapphire is the stone of Saturn. In old European and Indian cultures, it was used to represent and reflect the power of heavens, the sphere of angels, magic (metaphysics), fidelity and friendship. It is revered as a stone of royalty as it is believed to hold the power to keep its bearer safe from harm and envy. The hexagonal-trigonal crystal system formation of sapphire takes the characteristics of the oxide and corundrum mineral stone family. It is magmatically formed from the liquid forms of aluminum-rich granite, syenite or pegmatite through a series of metamorphosis of similar rocks such as gneiss, crystalline slate and marble. It takes its distinct color and luster from its iron and titanium components. Kaolin clay (contains trace amounts of aluminum), iron-oxides and titanium dioxide are minerals found in mineral makeup. The finest pieces of sapphire were discovered in Tanzania, Pakistan, Afghanistan, East Africa and Australia. American sapphires are known for their pastel palette. As it occurs in the form of an asterated star, resulting from the inclusion of the small cylindrical cavities within its crystal composition, it acquires a form that is parallel to the prism planes. This explains its ability to share energies and establish vibrational signatures of different spiritual properties. Prosperity, health, protection and safety are the sustaining gifts of life carried by sapphire. Its enigmatic power appeals to energies that eliminate frustration and replace it with fulfilling dreams and desires of the conscious being. It bears the straightforwardness of directing scattered spiritual energies into one single goal. This way, it helps us look into our lives in ways that will help us stand up to scrutiny and end up living in harmony, health and peace. The calming effect of sapphire helps ease depression and other psychic illnesses. As it is symbolic of the love for wisdom, it helps strengthen the power of belief and love for truth. It helps us clear out our intentions, bringing about a realization that makes it easier for use or accept life as it is. And while this precious stone encourages spiritual healing, it also influences our physical state, alleviating pain and illnesses that may interfere with the harmonic balance of our existence. Without conscious initiation, sapphire radiates energy to focus it on causes that needed our attention. In cases of illnesses, it aids the body in healing cellular disorders, strengthens the walls of the veins to support the flow of life. To stimulate healing, it brings out the energy of cooperation to the cellular level. Even in such things as eczema. In this light, it assists the provision of strength and health for us to go on with our endeavors. The attributes that gives the stone the power to hold mystical knowledge and information influences its ability to relate to the intuitive, psychic and astral aspects of our existence. The variety of colored sapphire made it an essential element to laying-on-of-stone applications. Each color has its own meaning. The placement of each color is meant to attract all things positive, healing and peace to both our spiritual and physical beings. Hence, its significant influences to our mind, body and intuition are helpful in bringing lightness and joy to our lives. When wearing mineral makeup, you may even be wearing some sapphire influences!